We recently had a horrible clog in our bath tub. We tried good ol’ Drano, but it simply wasn’t cutting it. One night, my husband was about to give the kids a bath. I was in the other room getting the kids undressed when all of a sudden I heard him yell out. Apparently our drain had gotten so bad that it was now turning on us. As soon as he turned on the water, junk started coming up the drain and into the bathtub! I don’t even want to try and describe the gunk that was coming up, suffice to say we had a feeling it was time to call a plumber. However, I’m frugal by nature and I honestly hate spending money on things that I think we can handle ourselves! 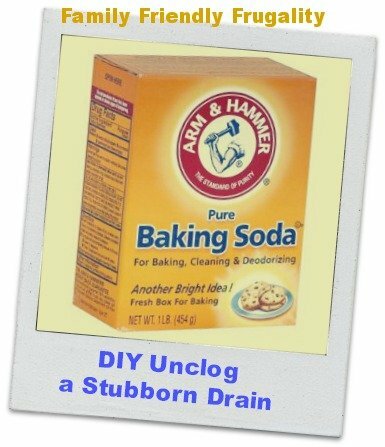 I googled a few things and came across a few forums that suggested I pour baking soda followed by boiling hot water down the drain. First I poured a good amount of baking soda down the drain. Probably about 1/2 a cup! I let it sit there in the drain and I went to the kitchen to boil a pot of water. Next, I walked the pot VERY carefully (be sure to call out to anyone in your house to let them know you are walking around with boiling water. If your house is anything like mine, little feet can turn corners at any time!) to the bathroom and poured the boiling water down the drain. It kind of fizzled a bit with the baking soda and I left the drain alone for about 20 minutes. Than I ran some regular tub water through it and was shocked how quickly it went down the drain! I did see some other tips to incorporate vinegar as well, but I didn’t end up needing to do that. The baking soda + boiling hot water did the trick on our stubborn clogged drain! Do you have any tips for DIY home repairs or cleaning? Awesome. I keep baking soda on hand at all times. It’s a good tub cleaner too. Heather…I buy bulk sized Arm and Hammer over at Sam’s club for under $5…I even use it in my baby’s laundry with vinegar (sensitive skin). Interesting! I’ll check into it next time I am at Sam’s Club. Thanks for the tip! I think I’m gonna do this tomorrow on our bathroom sink. The kids can’t wash their hands in there right now cause it fills up so fast with the drain wide open. I don’t like them rinsing their hands and touching the back of their hands to the bubbles in the sink. Yuk. How much vinegar do you add? I would recommend using DrainFX. I heard about it on the Gary Sullivan show. It turns your faucet into a mini pressure washer and cleared my drains quickly & effectively. It’s reusable & eco-friendly. I had to buy mine online but it was worth the wait.